At the Cathedral of Christ the King in Lexington, Catholics who are part of a rapidly expanding prayer group find both qualities accurately describe the praise and worship they experience together. Sister Georgette Andrade is involved with “this healing prayer ministry” full time, she said. She recently retired as the cathedral’s parish secretary, a position she had held for 12 years. 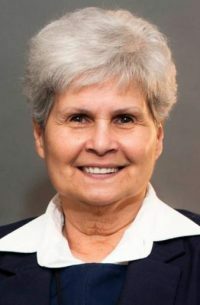 “It is a ministry where we praise and worship the Holy Spirit, with music and words of kindness to others,” Sister Georgette told Cross Roads, newspaper of the Diocese of Lexington. The prayer group follows the Catholic Way Bible Study, which emphasizes evangelism, discipleship, praise, worship and discussion. “Everything is Holy Spirit-led; we rely on him to bring into our minds what we need to pray for,” said Sister Georgette, who as a religious renews her vows yearly with Lexington’s bishop. “Whatever else” also can also mean cures. She recalled that “two weeks later, I found out (that) eight hours after I left, she had begun recovering, and gone back to school,” said Sister Georgette. Joan Root, and her husband, Deacon Paul Root, also are members of the prayer group. What would he say to someone thinking about joining the cathedral’s prayer group? Glover writes for Cross Roads, newspaper of the Diocese of Lexington.